The rare architectural Georgian Gothic gem that is All Saints Church, Newton Heath, was founded in 1556. 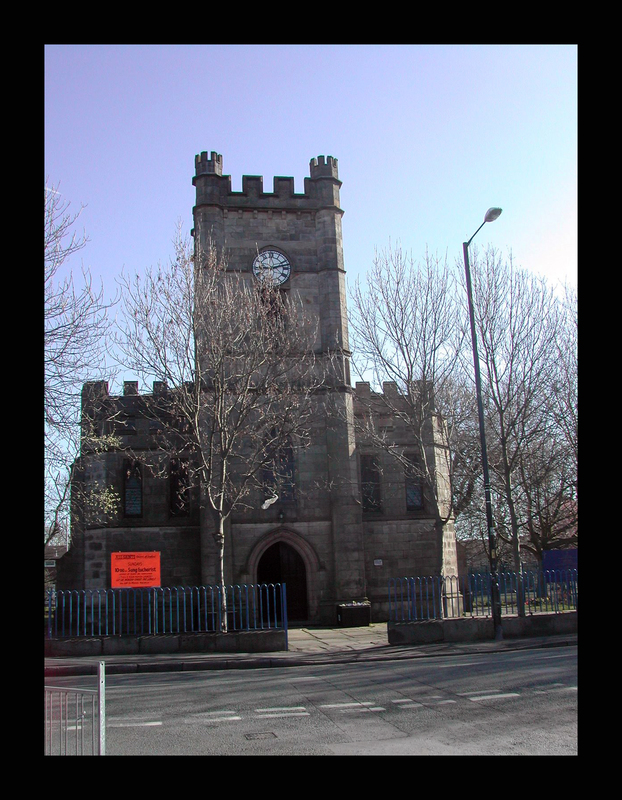 The church was Grade II listed on Oct 3rd 1974 and stands prominently and proudly at the top of Briscoe Lane – the old Roman Road – heading North towards Oldham via Failsworth and has welcomed visitors for centuries. The current building dates from 1816, the previous building having collapsed in 1808. There is some evidence that an earlier church prior to 1556 may lie beneath the current building, which lies directly on the old Roman Road which ran from Manchester to York. The road was then called Stane Gate (Stone Road) and was described in 1760 as “The finest remains of a Roman Road I ever saw” by historian Dr. Thomas Percival. The course of the road locally is Store Street, Old Mill Street and Briscoe Lane to Roman Road in Failsworth. The church of All Saints is a substantial Gothic stone building, consisting of chancel, nave, aisles and square tower containing one bell, and contains a magnificent stained window, the gift of James Taylor esq., of Newton: there are 1000 seats, 350 of which are free. The register commences in 1723. The living is a rectory, yearly value £300, with residence, in the gift of the Dean and Canons of Manchester, and held by the Rev. William Hutchinson, BD, of Emmanuel College Cambridge. Connected with the church are two Sunday and day schools: the average number of children attending these schools is-Sunday 1,100, week-day 600. Taken from Kelly’s directory of Manchester, 1873. The Monumental Inscriptions in the graveyard covering deaths between 1717-1916 are held at the Lancashire Record Office (LRO) . Original registers are held by Manchester Archives and Local Studies Department at Manchester Central Library . Register transcripts are published by the Lancashire Parish Register Society . Indexes can be searched for at International Genealogical Index . Marriages 1837-1860 are held within Lancashire Birth, Deaths and Marriages . Sadly as with many churches around the country, all the stained glass is covered/ protected by galvanised ferrous or stainless steel glass guards, which is not in keeping with the Gothic architecture. To reveal the stained glass whilst protecting it’s integrity, traditional stained glass protection can be replaced by polycarbonate guards which allows light to pass through as well as allow any pictorial elements or detail of the stained glass to be seen, whilst being virtually indestructible. This would then enable everyone to appreciate the beauty and unique stained glass that one of Manchester’s oldest churches houses, revealing many of the actual members of the Newton Heath community who were immortalized in the glass. A real rarity for a Manchester church. However, in 2012, restoration work started a number of years back, is continuing to reveal some of the hidden splendour of this magnificent and rare hertiage asset of Newton Heath. You can find more information about this and All Saints Church on their Facebook group and page.